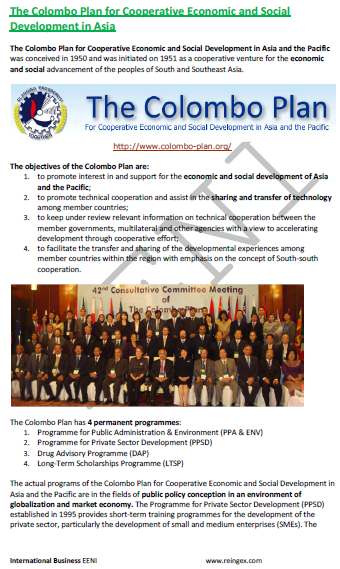 Syllabus of the Online Course (Subject): Colombo Plan for Cooperative Economic and Social Development in Asia. The Colombo Plan for Cooperative Economic and Social Development in Asia and the Pacific was conceived in 1950 and initiated on 1951 as a cooperative venture for economic and social advancement of South and Southeast Asian people. The members of the Colombo Plan for Cooperative Economic and Social Development in Asia and the Pacific are Afghanistan, Australia, Bangladesh, Bhutan, Brunei, Fiji, India, Indonesia, Islamic Republic of Iran, Japan, South Korea, Laos, Malaysia, Maldives, Mongolia, Myanmar, Nepal, New Zealand, Pakistan, Papua New Guinea, the Philippines, Singapore, Sri Lanka, Thailand, and Vietnam. The actual programs of the Colombo Plan for Cooperative Economic and Social Development in Asia and the Pacific are in the fields of public policy conception in an environment of Globalisation and Market Economy. The Colombo Plan belongs to Sinic-Buddhist Civilisation, Hindu Civilisation, and Islamic Civilisation.